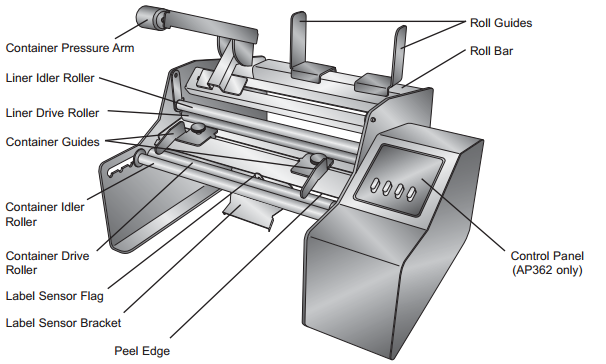 The AP360 or AP362 stops during label application. > Knowledge base> Article: The AP360 or AP362 stops during label application. 1. Push down lightly on the container pressure arm during application. You can also adjust the tension of this arm. To set it properly, push the container pressure arm slightly below the top of your container. The arm is spring loaded and should allow you to slip the container into position and maintain pressure. 2. Move the label sensor closer to either edge of the label or toward the center if it is already at the edge. 3. Move the container idler roller closer to the container drive roller. It should be as close as possible while still providing enough support to hold the container. 4. Place the container on the AP362 while the drive roller is moving. Watch the container for excessive up and down movement. If the container shape is not a perfect cylinder it will cause the label to bounce. Remove the container from the AP362. Press the foot switch. Be ready to catch the label as it comes off the peel edge. If it comes completely off, you know the container is causing the problem. 5. Very light plastic containers can also cause bouncing. Try filling the container before applying the label. 6. (Advanced Option!) You may also adjust the label sensor trigger point if it has come out of calibration. 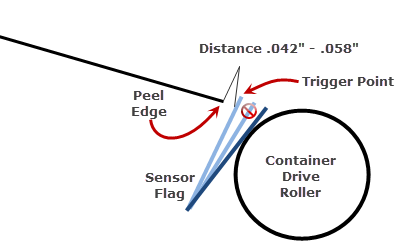 The sensor flag trigger point may be too close to the container drive roller. If that is the case, the slightest bump/bubble in the label will cause the liner drive roller to stop, therefore stopping the label from applying. It should be stopping the liner drive roller between .042 and .058 inches from the peel edge. You can gauge the trigger point by removing labels and containers from the applicator and then depressing the flag so that it is touching the container drive roller. Press the foot switch. Now slowly let the flag fall back toward the peel edge. It should stop the liner drive roller between .042 and .058 inches from the peel edge. You can make a gauge by measuring the thickness of several sheets of paper or Post It notes. .058” is approximately 15 Post It notes. (13 Post It notes was .042”.) If it is out of position you can BEND the sensor flag into position. There is a pivot point on the sensor flag that can be bent by hand. Labels are applied to the container crooked. Label edges fold over or catch on the sensor as they are applied to the container. How do I setup my AP360 or AP362 Label Applicator? What is the best location for my AP360/AP362 Label Applicator? What are the container and media specifications for the AP550?